Let’s party like royal-tea, new release pre-orders are now open! 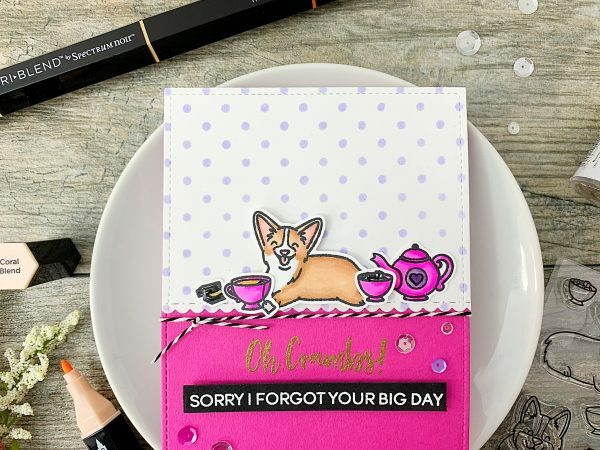 It’s Jessica here and today I have a super cute corgi project featuring our brand new Oh Crumbs stamp set. I’m hoping you grab a cuppa and join our little tea party! Before we get started I have to share, Release 6 pre-orders are finally live! I know you have been waiting for these! Check out the whole collection here. 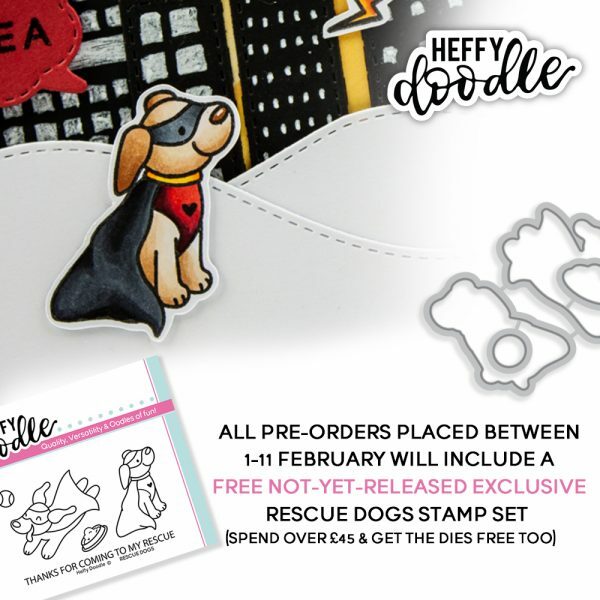 We’ve got an awesome promotion happening as well, all pre-orders placed between February 1st-11th will include a free exclusive Rescue Dogs stamp set. Spend over £45 and get the coordinating dies for free too (£45 before shipping costs). These pre-orders will be shipped on release day 11th February, and to qualify for the free Rescue Dogs promotion, you must purchase at least one item from our new release. These sweet pups are the perfect companions for the images in the Superdudes stamp set. Now onto today’s card! I started by creating the background using a standard polka dot stencil and Shaded Lilac Distress Oxide Ink. For a little interest, I added a basic scalloped edge and adhered to hot pink card stock. Next, I stamped and colored in the main images from the Oh Crumbs stamp set using Memento tuxedo black ink and Spectrum Noir TriBlend Markers. For the sentiments, I heat set “Oh Crumbs” with gold embossing powder and paired with a white embossed black sentiment strip. To finish off the card, I added bakers twine, 3D foam tape for dimension and glossy accents to the teacup. Oh Crumbs is so CUTE! 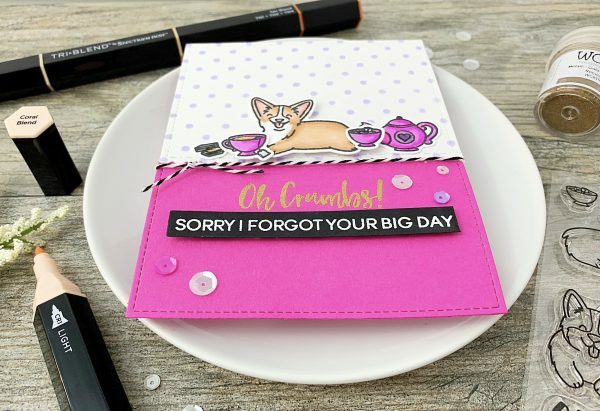 Oh Crumbs – how can anyone resist the cuteness of this stamp set. In fact a card and stamp set should be sent to Her Royal Highness! Too adorable for words and the long wait will be unbearable…almost.